For maximum audio performance, increased bass output, and reduced unwanted resonance, each speaker utilizes a highly rigid medium density fiberboard (MDF) for its enclosure and bass reflex ducts. To optimize sound quality and reliability, the woofers are made with aramid fiber cones and soft dome tweeters infused in magnetic fluid. To improve airflow through the port of the enclosure, the port hole was engineered with grooves to help direct the sound waves smoothly. The technique decreases standing waves from the mouth of the port, resulting in smooth bass and mid-bass output with more impact. Matching the bass output of the speakers, the soft dome tweeters are set in the center of a convex diffuser optimizing output and dispersing the sound energy in both left and right directions for wider imaging. For a cool cosmetic look, the diffuser illuminates in white when the speakers are powered on. A highly efficient Class AB amplifier drives the speakers in a bi-amp configuration to power the tweeters and woofers separately. All models feature three types of inputs - XLR, TRS, and RCA - for connection to different devices, such as external sound cards, computers, DJ equipment, and portable devices. For convenience and power conservation, the speakers include an Auto Standby mode that automatically turns itself off when there is no input signal sensed after 25 minutes, and powers back on when signal input is detected. 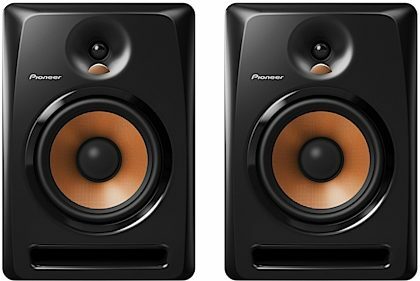 "Pioneer Built8 Powered Studio Monitors"
Overall: Purchased a pair of Pioneer Built8 powered Monitors to use a Dj monitors to practice on a home. I am very pleased with the sound and quality of these self powered speakers for playback. They sound good and look nice as well. The option to self power on and off when a signal is detected or not is a awesome added feature. For the price point and quality these cant be beat for a small set of speakers that perform well. Overall: Bought a pair of these for my lounge room dj set up in my home. I'm not a producer I just wanted some good monitor speakers that would sound and look nice. Bass is nice on the monitors but the high's are missing. Bass over powers the sound and had to keep turning up the mid and highs on my mixer. After a week of use and not pushing them very high one blew out. Called Pioneer to see if there were any issues with built8 and they said they haven't heard anything. I might of just gotten a bad monitor. Very disappointed considering a torture my jbl 5 inch to the max without any issues.